Blackinton B956-PI Cancer Awareness Badge - B956-PI - 2 9/16" x 2 9/16"
Home > Blackinton > Police Badges > Star Badges > B956-PI Cancer Awareness Badge - B956-PI - 2 9/16" x 2 9/16"
B956-PI Cancer Awareness Badge - B956-PI - 2 9/16" x 2 9/16"
This Blackinton B956-PI badge brings awareness of cancer to the forefront with the signature pink we all know. This is a 6 point star with ribbed texture and balls at each point tip. Personalize three scrolled panels and bottom tab with department and officer information. Choose from a wide selection of full color seals for the center. 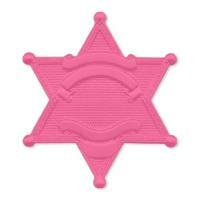 The Blackinton B956-PI cancer awareness badge measures 2 9/16 x 2 9/16 and is manufactured in the USA. Please allow 4-6 weeks for delivery of this badge. ©2002-2019 CopsPlus.com: Blackinton B956-PI Cancer Awareness Badge - B956-PI - 2 9/16" x 2 9/16"